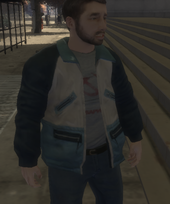 Oleg Minkov is a Russian civilian living on Iroquois Ave in Hove Beach, Broker, in Grand Theft Auto IV. He is extremely paranoid about the government. A government agent at United Liberty Paper hires Niko Bellic to kill Minkov, which he does after a car chase. Minkov's apartment is only accessible during "Wrong is Right". The apartment has a front and rear door, consisting of two rooms and a hallway. There is a laptop on the living room table that can access the Internet and Minkov's e-mails. The interior of the apartment can be viewed through the rear window, though the interior would not be loaded from the outside. It is possible that Minkov can still be alive and pass the mission, this may be an overlooking by R*. It can only happen if you get the car to explode and when he dives out, he doesn't die. This page was last modified on 26 October 2013, at 17:16.